Some years ago (::1::, ::2::), the Chinese Shanghai Hero Pen Company surprised the fountain pen community by launching an unabashed copy of the very popular model Lamy Safari. That Hero model, the 359, opened the gates for other Chinese companies to follow suit. The Jinhao 599A is one of those. 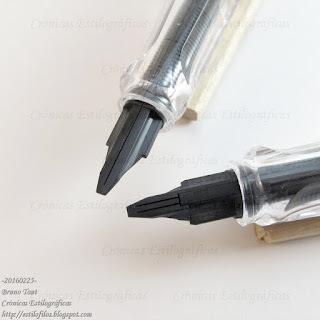 However, both Jinghao and Hero models show some very clear differences with respect to the original Lamy Safari: clip and nib for the Jinhao, barrel and cap top for the Hero, were the more evident distinctions. The Lanbitou 757 seems to be even more faithful to the Lamy Safari. 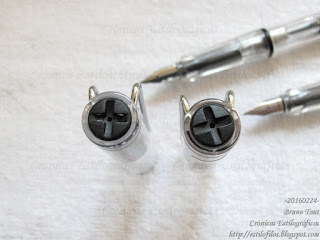 Nibs are interchangeable, barrels match both in shape and in size… The external differences are limited to the inner cap –black plastic on the Lanbitou, shiny metal on the Lamy--, and the engraving on the barrel. Lamy Vista (Safari demonstrator) and Lanbitou 757, side by side. Can you spot the differences? A closer inspection shows that the materials of these demonstrator versions are different, and the feeds also follow separate ways. 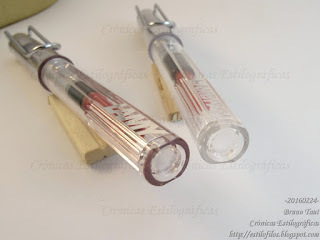 But most parts are interchangeable between Lamy’s and Lanbitou’s pens. 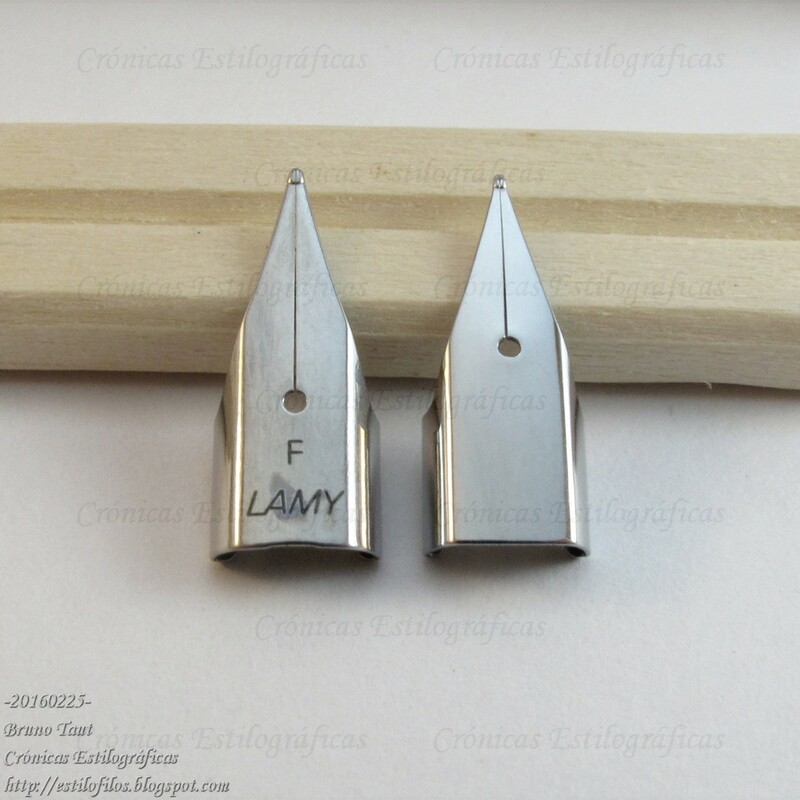 The feeds are different: one slit for the Lanbitou, two for the Lamy. Both cap tops carry the emblematic cross of Safari fountain pens. 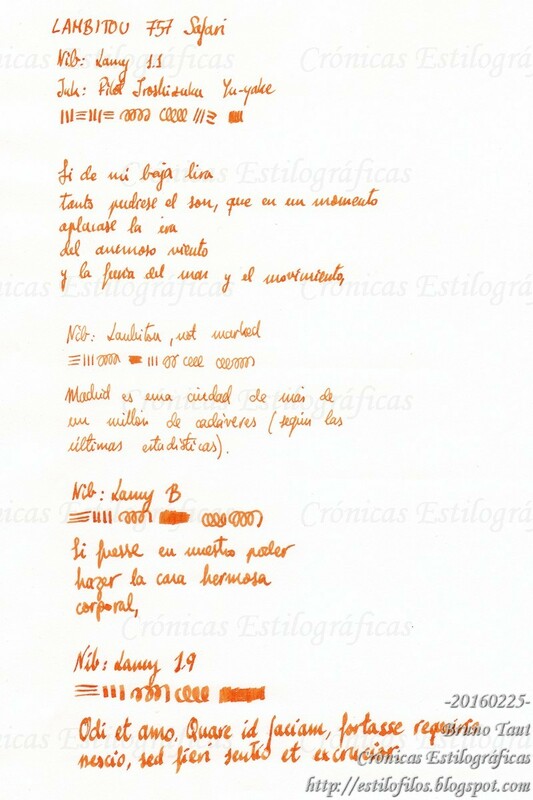 The writing quality of the Lanbitou is more than acceptable. It has a reliable flow that is up to the challenge of much broader nibs than that provided with the pen. This original nib is on the dry side, but could easily be tuned to make it wetter. It is not labeled in any way, but I guess it corresponds to an F point. As I implied before, the pen accepts Lamy nibs without any problem. 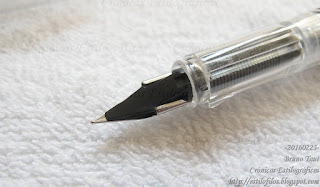 Lamy nibs are richer in ink than the Lambitou one, but this is nothing can could be changed easily. Note how the feed is able to provide the ink for all of the points. All in all, this Lanbitou 757 is nothing else than a knockoff of the Lamy Safari, and all the arguments exposed to finally absolve Hero of any legal infringement do apply here as well. Very few legal grounds could Lamy find to protect a design from 1980. 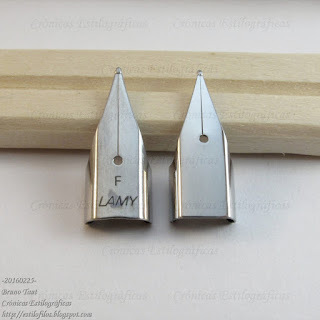 The question, then, is a different one—is it worth to copy an inexpensive good as the Lamy Safari or the Pilot Petit-1? Let the market speak. My thanks to Mr. Mizukushi. Thanks for the post. 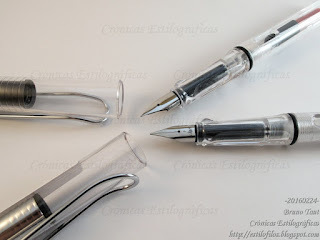 Interesting observations and comment "is it worth to copy an inexpensive good as the Lamy Safari or the Pilot Petit-1?". I have a few "copies" of notable pens. I don't mind having or using them as long as they write well. I like playing with inks more than the pens at this point, and having several pens inked up at once sitting on my desk ready to go would be terrible expensive if I were to purchase on $50 fountain pens instead of mixing in some sub-$10 knockoffs. With that said, I'm also a budding collector and do indeed like to buy nicer "brand name" pens when I can afford it. Appreciate your thoughts. Thank you for passing by and commenting, Jerry Fahmi. Certainly, inexpensive pens play an important role in this hobby, but my question is different--is it worth for these Chinese companies to copy already inexpensive pens? Given that the originals are not that expensive, would the user consciously decide to purchase the knockoff? Just a theory, and a random one at that, but are the copies for the home market where imported goods, like the Lamy original, would be too expensive for an emerging market? If anyone happens to know how much a Vista is in mainland China, especially in relation to one of the copies, it might help explain the economic case. Yours is an interesting point, Saltire Turquoise. In fact, that argument could also be applied in Japan, where a Lamy Safari costs about EUR 30 (MSRP) whereas the Lanbitou, in eBay, is less than EUR 7, plus shipping. I also wonder how many non-obsessed people really know about Lamy and about Lanbitou (or Hero, or Picasso, or Jinghao).